Whether you're an expert or a beginner, Championship Chess Pro is sure to please. Packed with the most features available, this game will improve your skills while you challenge playful characters. If you are new to the game, take advantage of the interactive tutorial to show you how to play. Other practice features such as hint, undo, and replay will help build your confidence. If you are a seasoned pro, try to corner one of our eight animated opponents who adapt to your play style and use advanced strategies with a humorous twist. Detailed statistics will help you track your success and optimize your strategy. Hundreds of game and scoring options allow you to customize the game to your taste. You can even create your own customized player personality and image for display while playing online. Five skill levels provide everything from a relaxing game to challenging tournament-style action. Never play the same game twice - make each game distinctive by selecting from over a dozen colorful board and piece combinations, enhanced by dozens of player taunts, game sounds, and soundtracks. Custom skins even allow players to easily package and share their favorite customized themes and characters with their friends. Five skill levels - Enjoy everything from a casual game up to top notch tournament style against eight computer personalities. Interactive Chess tutorial & practice options including hint, undo, & replay make learning easy for beginners! Stalk your opponent with Standard or Timed play. Tournament-level opponents challenge expert players using advanced strategy. Play online for FREE - No monthly fees or advertisements! Track game statistics and play ranked games online to become a Chess Grand Master. 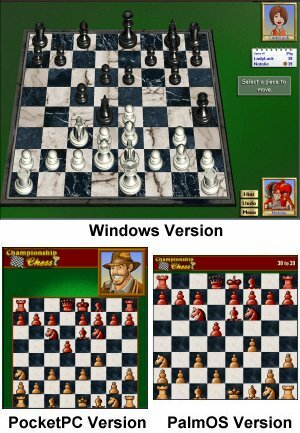 Cross-platform support - The only Chess game available for PC-Windows, Palm, Pocket PC, and Symbian phones. Challenge players online via wireless technology. Team up with Windows, Palm, Pocket PC, and cell phone players from around the world! 60-day 100% money-back guarantee if not completely satisfied!